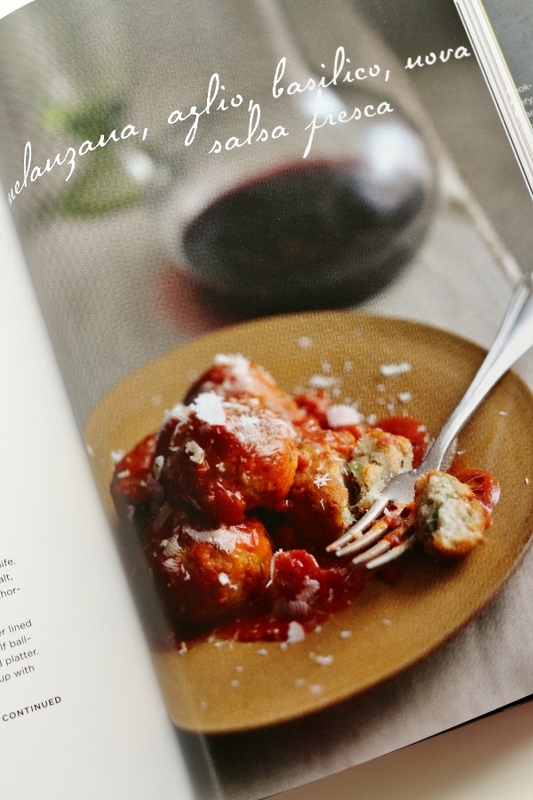 I am a fan and owner of two of Domenica Marchetti's cookbooks, The Glorious Soups and Stews of Italy and The Glorious Pasta of Italy, which I had the honor of reviewing on Mission: Food a couple years ago. I was very excited by the release of her newest cookbook in this series, The Glorious Vegetables of Italy, not only because I love her books, but because I love vegetables and am always excited to discover new ways to prepare them in my kitchen. The book features stunning photography by Sang An, and although there aren't nearly as many photos as there are recipes, the ones included in the book are drool-worthy. 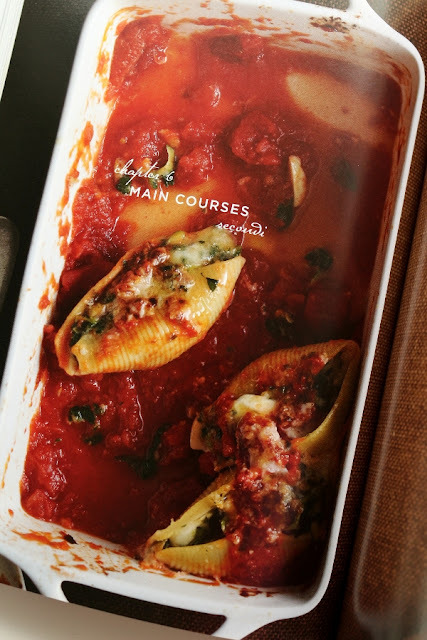 Starting out with a chapter entitled "Vegetable Essentials," Marchetti includes a Gallery of Italian Vegetables, which features everything from artichokes to winter squash and pumpkin. It shares English and Italian names for each, as well as seasons when they are available, notes on cleaning them, as well as preparation. Although I own The Field Guide to Produce, which I usually turn to for this info, I find it a very useful inclusion along with some great veggie photos. 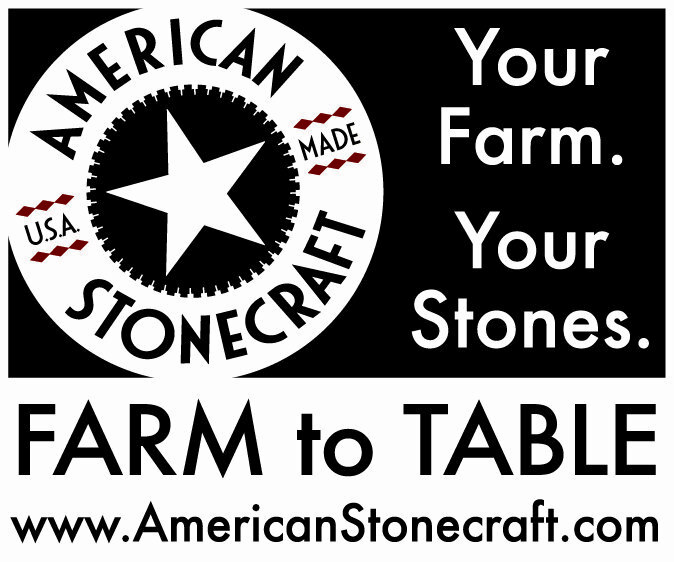 It's an excellent resource for the recipes that follow. Over a dozen Basic Recipes are followed up with chapters entitled "Appetizers," "Garden Soups and Salads," "Pasta, Risotto, Gnocchi, and Polenta," "Pizza, Calzoni, and Panini," "Main Courses," "Side Dishes," and "Desserts." Enticing recipes range from Crostini with Taleggio and Caramelized Onions to Carrot-Ricotta Ravioli with Herbed Butter. 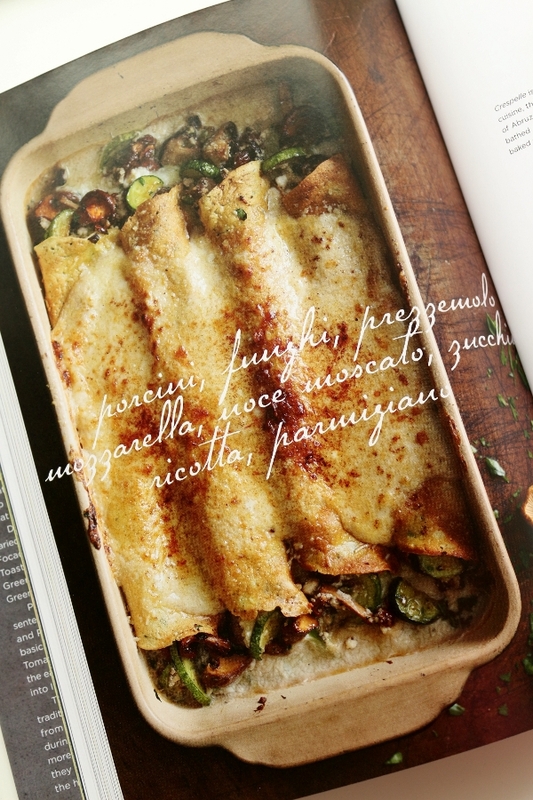 Crepe Cannelloni with Mushrooms and Zucchini gives way to Eggplant "Meatballs" in Tomato Sauce and Beet and Beet Green Gratin with Fontina and Gorgonzola. Carrot Polenta Cake with Marsala and Winter Squash Panna Cotta take offer a sweet twist in this otherwise savory cookbook. Keep in mind, this isn't a vegetarian cookbook. 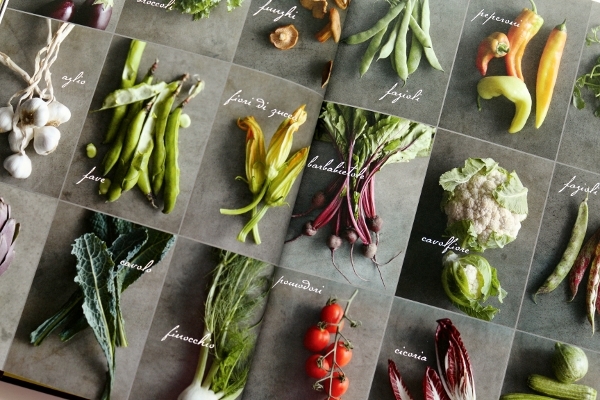 There is meat included in several of the dishes, but ultimately vegetables are the focus of this book, and they will be featured front and center. There are a lot of great recipes for any season, and I look forward to exploring more of the fall and winter recipes as the days get colder here in New England. 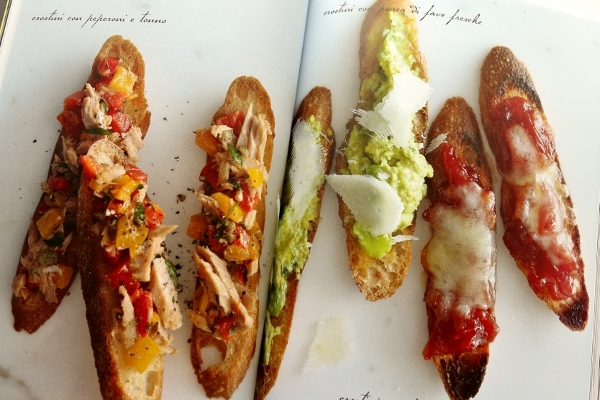 Until then, I selected a couple more summery recipes to get myself started. 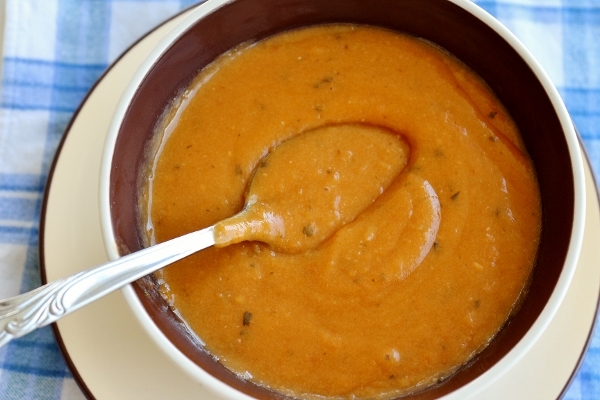 First, I tried my hand at making one of the soups in the book: Papa al Pomodoro, or a Tuscan tomato and bread soup. I have had this soup in restaurants before and always enjoyed it. Since I had tons of fresh tomatoes from the garden, it seemed like a great idea. It was easy to prepare, but the texture looked a little weird while it was cooking. The bread made it look almost gelatinous. It was meant to simply break down through cooking, and it did, but I decided to puree my soup to give it a smoother texture. I also added more liquid than the recipe called for. In the end the soup was delicious and velvety and had a nice background flavor from the Parmesan rind that simmered in it. 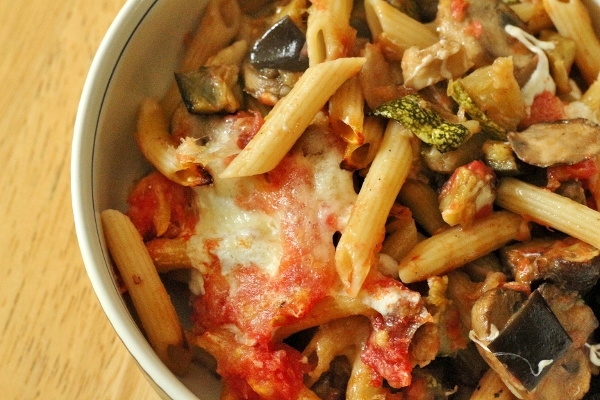 Of the two recipes I've tried so far, my favorite is definitely the Pasta al Forno with Roasted Vegetables (and that's the one I'll be sharing). What excited me most, perhaps, was that I got to use eggplant, zucchini, and tomatoes all from the garden. I also love the flavor attained from roasting the vegetables. The mushrooms--and there's a lot of them--boast an incredible umami flavor profile, while the eggplant and zucchini practically melt in your mouth along with the sweet onions. 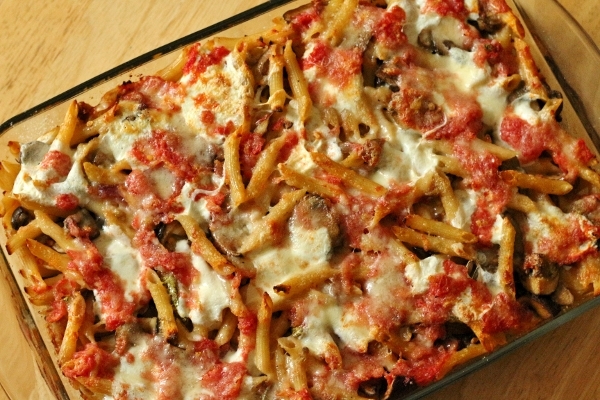 Add some decadent cheese and delicious pasta, and you've got a really great dish that makes it easier to feed vegetables to your family! 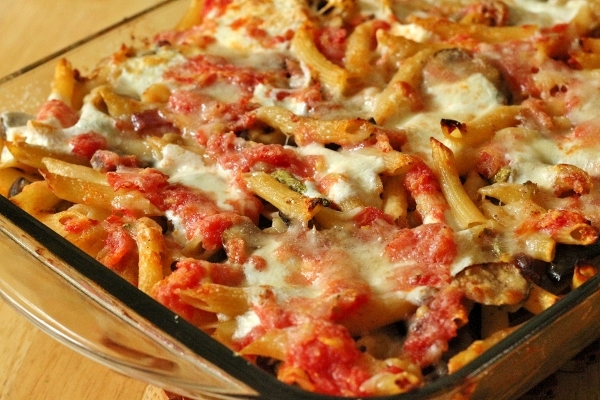 Although this pasta isn't really as "saucy" as many other baked pasta dishes, it perfectly showcases the array of roasted vegetables, along with a raw tomato sauce that is as fresh as can be (especially if you grate your own tomatoes instead of using the canned option). I'm well on my way to a love affair with this cookbook. 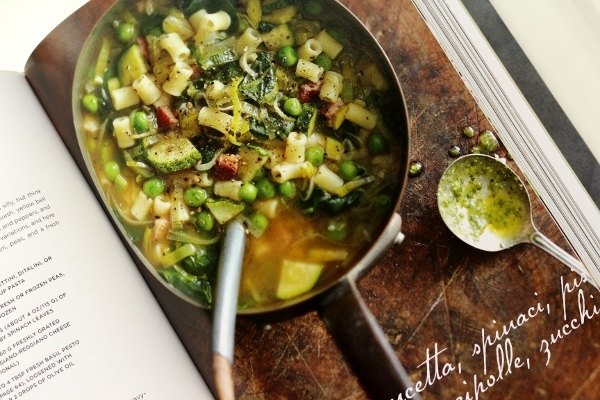 Marchetti's The Glorious Pasta of Italy is probably still my #1 (because I'm pasta obsessed! ), but this book is excellent and features a lot of really great dishes (including many additional pastas) to keep it on my bookshelf for a really long time. 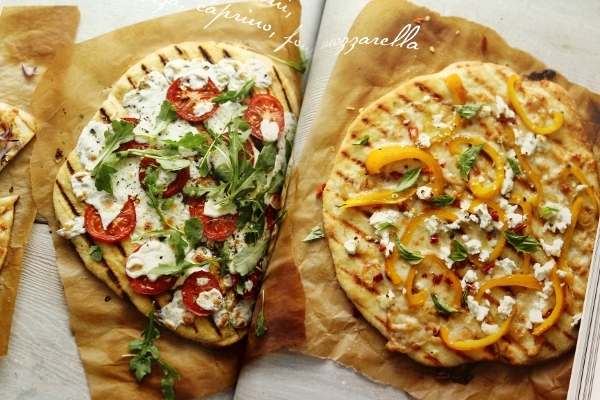 Heat the oven to 425 degrees F. Lightly coat a 9-by-13-inch baking dish with olive oil. Combine the zucchini, eggplant, onion, and garlic in a large roasting pan. Pour 1/4 cup olive oil over the vegetables and toss to coat them thoroughly. Season with 1 teaspoon salt and a generous grinding of pepper. Roast the vegetables, stirring them every 15 minutes, for 45 minutes, or until they are tender and nicely browned in spots. Scrape the vegetables into a large mixing bowl. While the vegetables are roasting, bring a large pot of water to a boil over high heat and salt generously. Add the pasta, stir to separate, and cook according to manufacturer's instructions until not quite al dente (it should be slightly underdone, because it will finish cooking in the oven). Drain the pasta in a colander, reserving about 1 cup of the cooking water. Put the tomatoes in a medium bowl and mix in the lemon juice, 1/2 teaspoon salt, and 2 tablespoons olive oil. 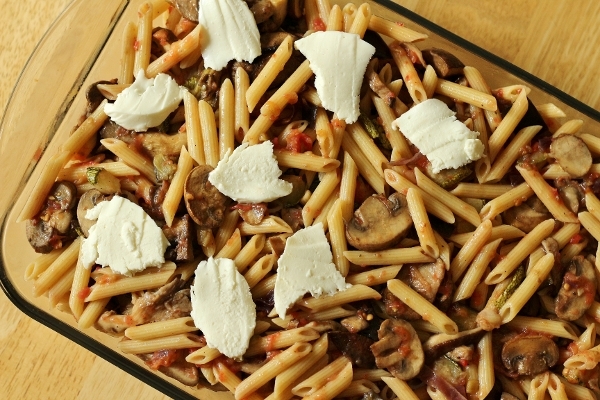 Transfer the pasta to the large bowl and toss with the roasted vegetables, the sausage, if using, and the roasted mushrooms. 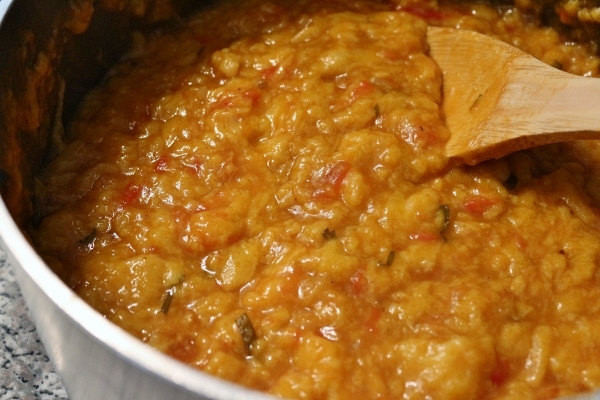 Add 2 cups of the tomato-lemon mixture and gently toss to combine thoroughly. Add a splash or two of pasta cooking water if needed to loosen up the sauce. Spoon half of the pasta mixture into the prepared baking dish. Spread half of the sliced scamorza over the pasta. Spoon the remaining pasta on top, and cover with the remaining scamorza. Spoon the remaining tomatoes over the scamorza. Sprinkle the Parmigiano on top. Cover the dish with foil (you may want to grease the foil as it will inevitably stick to the melting cheese) and bake for 20 minutes; uncover and bake 20 minutes more, until the cheese is melted and bubbly and the top is nicely browned and crisp around the edges. Let stand for 5 minutes before serving. *To grate the tomatoes, cut them in half, scoop out the seeds with your fingers, and grate them with the cut side against the large holes of a box grater until only the skin is left in your palm. I recommend grating them directly into a bowl to catch all the juices. Measure the oil into a small bowl and add the garlic clove. Let the oil sit for about 1 hour or until it is nicely infused with the flavor of the garlic. Remove the garlic and discard or save it for another use. Cut the mushrooms into big pieces or thick slices. Combine all of the mushrooms in a large bowl and drizzle with the garlic-infused oil. Toss them well to coat them with the oil. Season with salt and a generous grinding of pepper, and sprinkle the parsley over them, if using. Toss again. 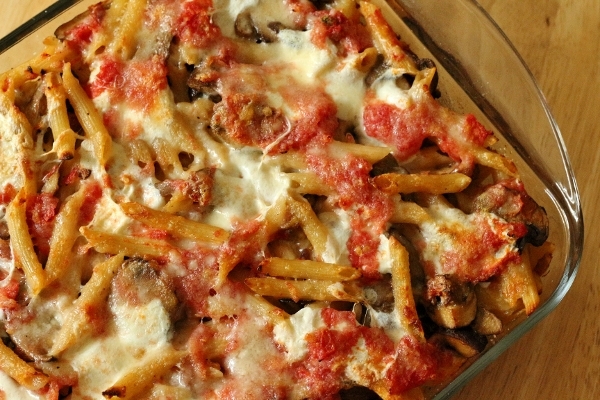 Spread the mushrooms out in one layer on a large rimmed baking sheet. Roast the mushrooms for 15 minutes, then toss with a spatula. Roast them for 10 minutes more, or until they are tender and browned, and the ones around the edges of the pan are lightly crisped. Remove the mushrooms from the oven and scrape them into a bowl. Serve immediately or reserve for another use. Store the mushrooms in a container with a tight-fitting lid and refrigerate for up to 5 days or freeze for up to 3 months.